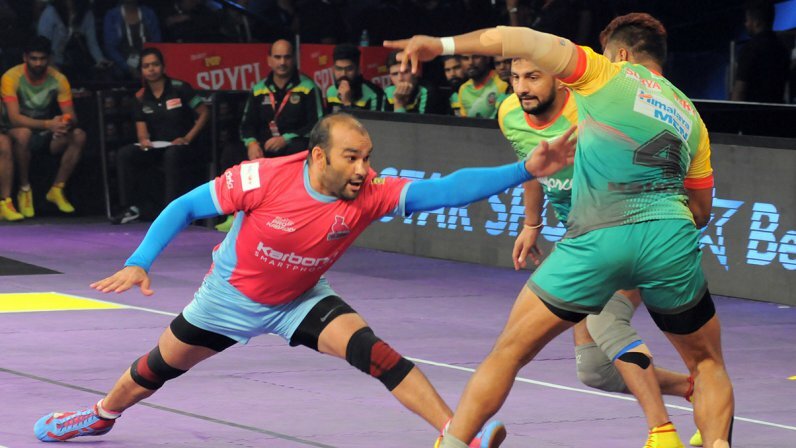 Anup Kumar; Manjit Chillar; Pardeep Narwal; Rakesh Kumar; Sandeep Narwal; Surinder Nara; Surjeet Kumar; Rohit Kumar; Mohit chillar; Surjeet Singh & Jasvir Singh .. ..
~ many of them household names since PKL - 2016 Pro Kabaddi League, the 4th season that attracted people in July 2016. Water tight defence coupled with the excellent raiding ability of Pardeep Narwal helped Patna Pirates extend their reign over the Pro Kabaddi League title as they downed Jaipur Pink Panthers in the finals – now the above is the team for Kabaddi World Cup 2016. The venue is ‘the Arena by TransStadia’ situate in the heart of Ahmedabad, a first-of-its-kind multi-purpose stadium in India with state-of-the-art facilities, built as a Public Private Partnership project with the Department of Tourism and approved by the then Chief Minister, Shri Narendra Modiji. This space will cater to 12 indoor sports, including kabaddi. Kabaddi World Cup has been running since 2004. India has always won Gold Medals in Both men's and women's teams. The 1st Kabaddi World Cup was held in 2004, 2nd was in 2007, and then annually from 2010 onwards. Last year it could not be held and now it is on – inaugurated today at Ahmedabad. India team led by Anup Kumar has always dominated this event by winning all the gold medals in both categories of men's and women's. The mens’ team has won all the 7 World Cups. This year Kabaddi world cup total 12 teams are participating and going one on one against each other. For the first time, Poland is taking part in the Kabaddi world cup – the others are : United States of America, Canada, England, Australia, Iran, Poland, Argentina, Bangladesh, Korea, Japan and Kenya. In the final of last edition of the Kabaddi world cup India defeated Pakistan to win the gold medal. Till now Pakistan has won the most silver medals-4 and on another hand, Bangladesh and Canada have won two bronze medals each. Pakistan, naturally has not been invited in the aftermath of the Uri attack and the events which followed. Pakistan Kabaddi Federation (PKF), sought postponement of the event. Today, Mr Vijay Rupani, Chief Minister of Gujarat inaugurated the tournament having unveiled the trophy earlier in the Vibrant Navratri Garba 2016 at GMDC ground in Ahmedabad. India looked comfortably closing in – but in dying moments, they were stunned by Korea. The finish came with a grand move by Jan Kun Lee at the death. Indian raiders let the team down today. Just 17 raid points in total. The stadium fell silent as Korea upset the starter winning 34-32 in the first match of the competition. India were in the lead for most of the contest but Korea produced a clinical performance towards the fag end, and wiped off the deficit before taking lead over defending champions India. The Korean unit was ecstatic after the win and thanked the crowd after registering an emphatic win. India did most of the things right in the match but failed to hold on the three-point lead in the final three minutes. 7th Oct 2016 @ 21:30 hrs.